Overseeding | Will It Help? Sometimes your lawn gets beat down and suffers from the season before. It might be thin or worn out from the traffic it might have encountered. This will have a tendency of making it drought or weed resistant opening it up to be overtaken by all that destroys a lawn. You ask yourself overseeding will it help? Well, in this post we will tell you how to do it to help your lawn recover. 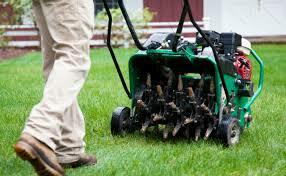 During the course of a summer, there are some things that can potentially hurt a lawn. If you don’t properly maintain it, your lawn suffers a bit. Depending on how strong your root foundation is will determine if it will be a survivor. If there is a big drought it can cause problems. If you have a lot of traffic in certain areas another problem as well. You might have a pet that chooses particular areas and that too causes a problem. The most common problem is weeds. Between the mentioned scenarios, this will cause your lawn to be thin, worn out, and your soil compacted. Overseeding will help your lawn to look good again. It will make it look full and vibrant if done right. A lot of people wonder should they go with the Spring or Fall planting. The truth is either will work. There are some things you should not do when overseeding. If you have used any kind of weed control you have to wait depending on what you used. Crabgrass control takes the longest waiting period which is around 4 months. Others are recommended to wait 1 month before planting. 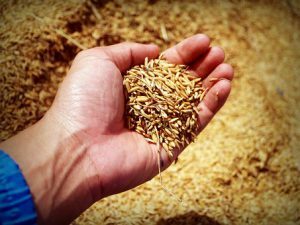 The golden rule is to see what the manufacturer of the seed you are using has to recommend. Also be aware that you have to pay attention to the thatch build up as well. This will block your seed from contacting with the soil preventing the seed from germinating properly. The things that were mention will affect whether your overseeding will successfully thicken your lawn and make it look healthy. Overseeding is considered a form of lawn repair and certain things can be done to improve your efforts. If your lawn has a lot of thatch you want to make sure you remove it the best you can. If it is more than a 1/2 inch, it can thwart your efforts as the seeds won’t settle in. If your soil is compacted it will also affect the root growth of the newly planted seed. In this case, you might want to consider aerating your lawn. If you do this make sure your soil is moist for better results. When you apply your seed, it is best to use a spreader rather than hand sowing. The manufacturer of the seed will provide the information on what spread rate gauge number to use. In fact, the manufacturer will provide information such as how to mow & fertilize your new seedlings after you are done. Before you plant your seed, Rake all your bare spots and cut your grass to its lowest height for your type of grass and collect the clippings to make way for your seeds to make contact with the soil. When you are done it is important to keep your lawn moist so that your seed does not dry out ruining all the effort you just put in. I always like to give a visual on all topics when I can because it gives you a more detailed explanation to help you grasp the concept. Take a look below! I hope this post will help someone better understand what it takes to overseed their lawn. This way if you decide to do it yourself at least you will know what is involved. You might ask why would I as a lawn service give this information. It is because everybody is not a do it yourself type person. And at the same time, everybody can’t fit into their budget to pay someone. So to me, there is nothing wrong with helping the next person out. 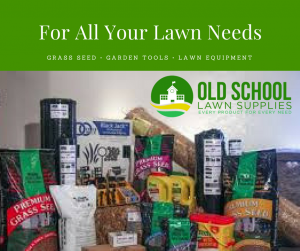 Just remember that you can get all you need from our online store which is Old School Lawn Supplies safely and securely. It is located in the main menu above. Thank you for visiting in and if you have any questions or comments please leave them in the comment section below.